The Word Nerds kicked off their Best of 2014 today with their Best First Book in a Series, and I'm delighted to report DEAD HARVEST tied Lyndsay Faye's THE GODS OF GOTHAM for the honor! Thanks to the titular Word Nerds, Bethany and Stacie, for the nod. CRIMINAL WORDS, A Free Short Story Audiobook, Now Available! A month or so ago, you may recall, my short story "Pretty Little Things" was featured on Erik Arneson's Word Crimes podcast. Today, a free (yes, free!) audiobook version of the Word Crimes podcast, CRIMINAL WORDS, is now available! CRIMINAL WORDS features my aforementioned short as well as stories from such talented writers as Erik Arneson, Joe Clifford, Jen Conley, David Cranmer, Chris Irvin, Tom Pitts, and Steve Weddle. All stories are narrated by public radio veteran Scott Detrow. Download a copy today! TROUBLE IN THE HEARTLAND Out Today! Every once and a while a project comes along that's too cool to turn down, no matter how swamped I am with other stuff. So it was with TROUBLE IN THE HEARTLAND, which is out today. 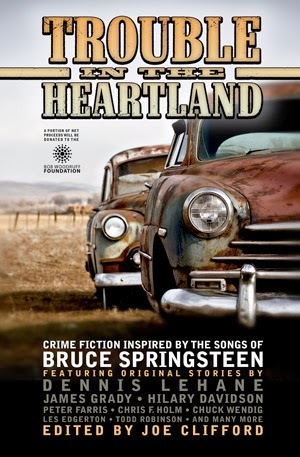 TROUBLE IN THE HEARTLAND is an anthology of crime fiction inspired by the songs of Bruce Springsteen. It features such talented writers as Dennis Lehane, Hilary Davidson, Todd Robinson, and Steve Weddle, to name but a few (click through to take a gander at the full list of contributors). And a portion of the proceeds benefit the Bob Woodruff Foundation, an organization dedicated to helping veterans. I was lucky enough to get my pick of songs to use as inspiration. The song I chose was "Mansion on the Hill." It's an achingly beautiful track off one of the most haunting records of all time, and I hope I did it justice. You can check out the tune below. Thanks to Joe Clifford, Zelmer Pulp, and Gutter Books for their hard work on this project. If you'd like a copy, or you've got a Springsteen fan on your Christmas shopping list, TROUBLE IN THE HEARTLAND is available at Amazon and Barnes and Noble. Or, if you'd prefer, ask your local independent bookstore to order you a copy.